(Warning: SPOILERS!) Star Wars: The Force Awakens is still going crazy at the box office. It has pulled in a record breaking $529 million around the world, and just broke the Monday box office record held by Spider-Man 2 since 2004. In turn, the new cast will probably see hefty pay raises in whatever they are offered next. But with all that dough rolling in, you have to wonder how much the cast was actually paid for this particular installment. 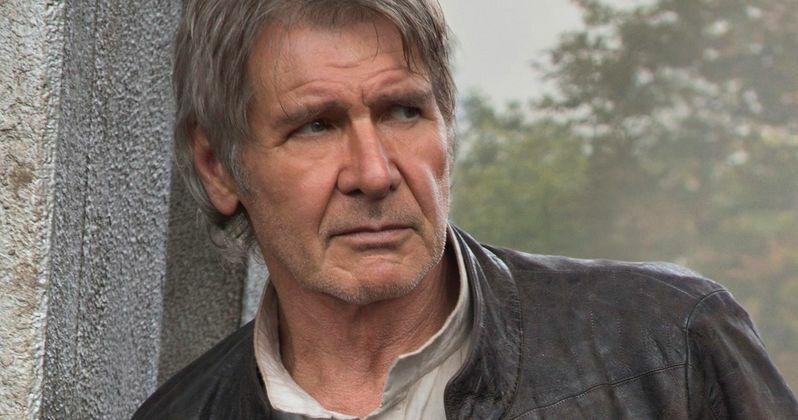 Variety reports that none of the actors made as much as returning favorite Harrison Ford. And as fans, we're okay with that for a lot of reasons. Sources close to Disney and LucasFilm claim that Harrison Ford was the big winner when it came to his personal banking account. He clocked in a paycheck that was 50x higher than the kids surrounding him, all of which had more screen time in Star Wars: The Force Awakens. The iconic actor is said to have walked away with a number somewhere in the eight-figure range, higher than $10 million but somewhere below $20 million. One source even claimed that Ford walked away with a cool $25 million to play Han Solo one last time. Yes, the actor dies on screen in the movie, with Solo killed at the hands of his own son, Ben (aka Kylo Ren). So of course he should have been paid more than the untested cast surrounding him. The man is a national treasure, and this is the last time he gets to play in this sandbox, unless they bring him back for a flashback cameo (which is possible). While the Daily Mail reports the actor pocketed $25 million, one Disney insider says that is false, and simply way too high. Another source confirms that his cut was quite a bit higher than everyone else participating in the sci-fi action sequel. Mark Hamill and Carrie Fisher are said to have walked away with paychecks in the low-seven figure range. Neither of them had as much screen time as Harrison Ford, with Mark Hamill's Luke Skywalker appearing for just over one minute. It's expected that Carrie Fisher's General Leia will be back for Star Wars: Episode VIII. Mark Hamill has already shot scenes for the next sequel on Skellig Michael Island, the location where Rey finds Luke hiding at the end of the movie. It is believed that Luke will have a role comparable to Han Solo's in this next installment. John Boyega, who plays the AWOL Stormtrooper Finn, and Daisy Ridley, who plays the Force sensitive Desert scavenger Rey, are said to have been paid in the low-six figure range, taking home paychecks between $100K to $300k. Secondary leads Oscar Isaac, who plays ace X-Wing Pilot Poe Dameron, and Adam Driver, who plays new bad guy Kylo Ren, are said to have received paychecks that were in the mid-to-high six figures. Both of the actors received higher pay than the two main leads because they had fixed quotes from previous TV and film work. John Boyega, who genre fans know from Attack the Block, and Daisy Ridley were paid less because they haven't appeared in too many projects at this early stage in their careers. And they have never appeared in a tentpole blockbuster before. Disney insiders claim that the studio decided in 2014 to create a 'Legacy' pay scale for all actors who had appeared in the franchise before, along with a general pay scale for all newcomers. This 'insider' did not say how much more Nien Nunb and Admiral Akbar made from their appearances. And it's not mentioned how much stars such as Anthony Daniels, Kenny Baker and Peter Mayhew pulled in as 'Legacy' performers. Of the entire lot, Anthony Daniels and Kenny Baker as C-3PO and R2-D2 are the only ones to appear in all 7 movies. And just how much Chewbacca time Peter Mayhew clocked in has never been addressed, but with as much action as Chewy sees in the movie, and the actor's bad knee and poor health, he obviously had a double doing a lot of the heavy lifting. It's expected that Mark Hamill and Carrie Fisher will get hefty raises for each incoming sequel, though it isn't known how much longer either of them will be around for. These reported salaries do not include back-end bonuses, which don't kick in until the film crosses $1 billion worldwide. And its expected that deals will be renegotiated for all actors as Star Wars 8 prepares to shoot this spring. Nothing about the deals is said to be out of the ordinary.